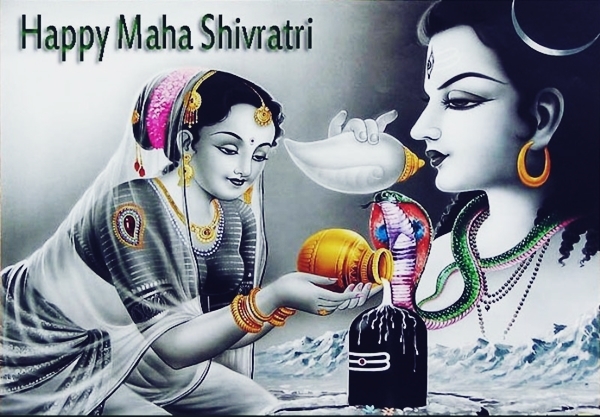 Happy Mahashivratri Date 2019 Mahashivratri, a Hindu festival that is celebrated every year falls usually in the month of February or March. It is observed remembering Lord Shiva and marks the overcoming of darkness and ignorance. In every luni-solar month of the Hindu calendar, on the 13th an 14th days, there is a Shivratri, which is in the month of February or March itself. Mahashivratri is one of the most important festivals is Hinduism. The common rituals or customs performed in observance of Shivratri are chanting mantra (Om Namah Shivay), saying prayers, keeping a fast, performing yoga and meditation. Meditation is performed keeping in mind loyalty, faithfulness, temperateness, non-violence to others, forgiveness, etc. The evolution of Lord Shiva is the most significant aspect associated to meditation. Some devotees with immense enthusiasm stay awake the whole night of Mahashivratri in the name of Lord Shiva. The origin date of Mahashivratri day is not known to anyone uptil now but it is a big occasion for all the Hindus. Every Shiva temple in India is full of devotees for the whole day who come to worship Lord Shiva by performing pujas, chanting prayers and seek blessings from him. Some people even pay visit to the Jyotirlingams situated in various parts of the Indian subcontinents. There are various Hindu liturgical scriptures that signify Mahashivratri in different manners, one of which says that it was the night when Lord Shiva had performed a heavenly dance of creation, preservation and destruction. Some other legend describes. Mahashivratri as the night when Lord Shiva got married to Goddess Parvati. According to another legend, offerings to the Lingam made to Lord Shiva in order to overcome our sins in the past and start a new and refreshed life. Many Puranas such as the Skanda Purana, Linga Purana and Padma Purana mention about the Mahashivratri. The Mahashivratri is observed for three or ten days based on the luni-solar calendar. A Shivratri occurs 12 times every year but the main Shivratri comes on the 13th night and 14th day of Phalgun month of the Hindu calendar, and so it is given the name as Mahashivratri. It falls in February or March based on the Gregorian calendar. An annual dance festival event takes place every year on account of Mahashivratri in the temples of Konark, Chidambaram, Khajuraho and Modhera. It is an event wherein the artists from all over India visit one of these places every year to witness it. At the Chidambaram temple, the event is named 'Natyanjali', meaning 'worship through dance'. The temple is popular for the various ancient dance forms portrayed in the form of pictures and sculptures. The Shiva temples at Khajuraho hold one of the major fairs and dance festivals on the day of Mahashivratri. Varanasi and Somnath are the places where major Jyotirlingams exist since ancient times. Special events and fairs are held on account of Mahashivratri over here, to which a large number of devotees pay visit and worship Lord Shiva in temples. In some parts of India, the devotees stay awake for the whole night of Mahashivratri and observe prayers, chant mantras or read our some sacred scriptures associated with Lord Shiva’s life. At the Isha Yoga Center situated in Coimbatore some special arrangements are made on account of Mahashivratri, wherein almost 600,000 to 700,000 devotees pay visit and take active part in the all-night festive event organised by Sadhguru. A 112-foot statue of Lord Shiva is present at the centre, to which the devotees pay visit and worship Lord Shiva by making various kinds of offerings. Situated at the bank of Beas, Mandi is the oldest town in Himachal Pradesh and is known for the fair it holds at the time of Mahashivratri. The town has got 81 different temples of various Gods and Goddesses and so is known as the Cathedral of Temples. Many devotees pay visit to this town on this holy day and also take part in the various fairs being organised over here. In the Kashmir, Mahashivratri is the most important festival. It is here celebrated as the marriage of Lord Shiva and Goddess Parvati. In Maharashtra, Andhra Pradesh, Kerala, Karnataka and Tamil Nadu, Mahashivratri is celebrated on bigger grounds. Maharashtra holds few of the main twelve Jyotirlingams and at all these places Mahashivratri is a grand festive even observed from the night of the Shivratri uptil the end of the next day. In Nepal, Mahashivratri is observed as a national holiday and people celebrate the day with utmost devotion. Special rituals are arranged at the Pashupatinath temple in Nepal and many devotees pay visit to this place n order to worship Lord Shiva and seek blessing by making different kinds of offerings. The Nepal Army parades around the cities of Nepal in order to pay a tribute to Lord Shiva. The devotees of Lord Shiva follow all the rituals systematically on the day of Mahashivratri. For the whole day the devotees observe a fast and break it compulsorily on the next day only after worshipping Lord Shiva for the whole night. The most special on this day is giving a bath to the Shivlingam in the Shiva temple using water or milk. People strongly believe in the fact that if you worship Lord Shiva with immense devotion, all your past sins move away and you are blessed with Moksha. On the morning of Shivratri, people wake up very early and taking a sunrise bath, they visit the Shiva temple and perform various rituals. They prefer bathing in the holy water of the river Ganga and consider it as the purest form of traditional bath. While having a bath in the river, the devotees pray to the sun as a part of purification. After this they visit the Shiva temples located in their nearby localities and give bath to the Shivlingam present at the temple. As mentioned in the Shiva Purana, the Shivlingam is given a ritualistic bath every three hours on the day of Mahashivratri. The bath is given using milk, water, honey, yoghurt, sandalwood paste, rose water, etc. While giving bath to the Shivlingam, the devotees chant the sacred Shiva mantra ‘Om Namah Shivay’. After the bath, a vermilion paste (tika) is applied on the Shivlingam and then flowers and bilwa patra (bel leaves) are offered to the Lingam. Bilwa patra was very dear to Lord Shiva. Special worship of Shiva by priests continues through the nightlong prayer vigil. During this ritual worship, Lord Shiva is offered special food made from the fruits of the season, root vegetables and coconuts. Those observing the Shivratri Fast break their fast the next morning by consuming the prasad offered to Shiva.